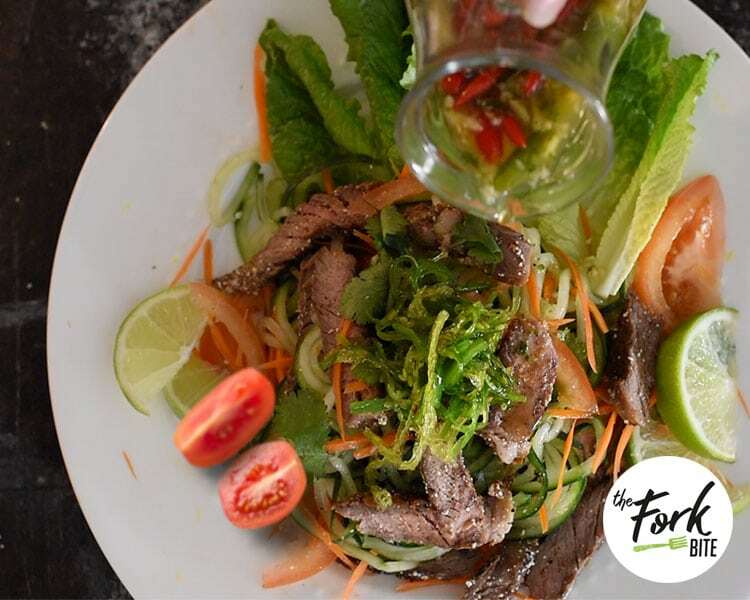 The enticing aroma of Thai Beef Salad owes its appeal to a special dressing you make from fresh ingredients. Feel free to substitute flavors you like for ones that are too spicy or cause allergies. That’s the excitement of an Asian salad! 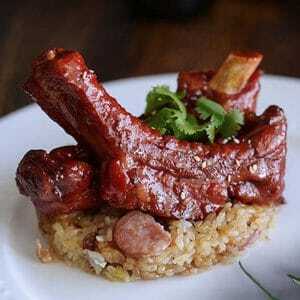 There’s so much the cook can do to personalize the ingredients without losing the zest of a fresh, tempting meal. If you’re like me, Thai Beef Salad is a common meal at the table no matter what the season. Of course, a cool salad is always a treat when the weather is hot. Perhaps the delicious chili-enhanced dressing brings about its popularity during the winter. A delightful burst of just-right heat adds a special zing to each bite. An additional bonus for this recipe is the opportunity to enjoy quality beef regardless of its price! Just a half-pound of steak satisfies the craving for beef of two people. The most important part is cooking the meat to please each person. Some people like their meat medium rare and insist any other result ruins the taste. The opposite end of the spectrum is the family member who only wants beef when it is well done and casts it aside if it’s not. Beef is a special part of this salad so take the time to please everyone, especially since this is just a recipe for two. Fresh coriander is available at quite a few grocery stores and specialty shops. It may even grow in your herb garden. Also referred to as cilantro, it’s a welcome addition to Mexican foods. Either name is correct for this leafy green herb. Do not exchange the fresh stems and leaves in this recipe with dried leaves or seeds that deliver a different texture and flavor. Chefs share preparation tips from time to time to encourage people to create special recipes. Hints about herb preparation, such as rinsing them before using, help create a delicious dish with very little effort on your part. Another hint that results in mouth-watering dressing for Thai Beef Salad is grinding the cilantro/coriander stems first in a mortar and pestle before adding the remaining dressing ingredients. The crushing encourages the oils and flavor to spill out and combine with the mixture. If you have no access to a mortar and pestle, you’ll achieve almost the same effect by chopping the stems very fine. Then add the pieces to the dressing and mix it well. You may want to make extra dressing to use for another salad later this week! 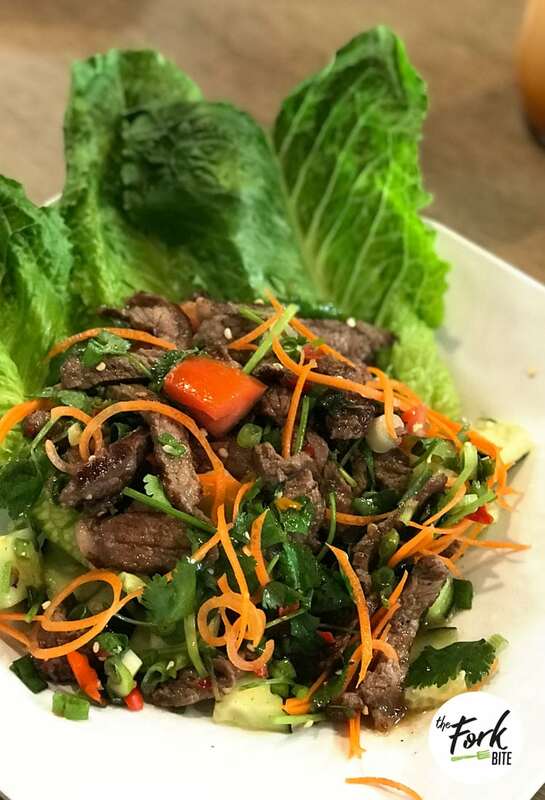 Grilled steak is served on a bed of spiral cucumber, romaine lettuce, carrots, cilantro with fresh mint and tossed in a flavorful lime juice dressing in this authentic Thai beef salad. Prepare your greens (romaine, carrots, cucumber, tomatoes, mint leaves) and set aside. 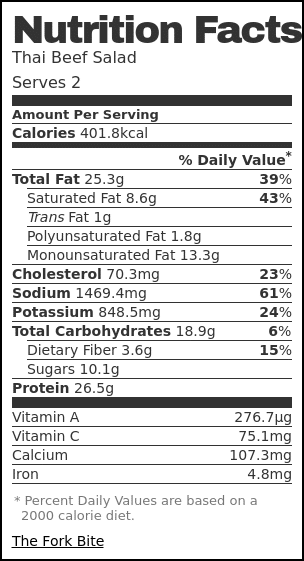 Add all the ingredients and adjust the taste (Read Note 1). Set aside. Preheat a skillet over high heat until hot and smoking. Cook the beef to your liking. Remove the beef from the skillet and set aside for 10 minutes to rest. Slice the beef thinly against the grain and sprinkle with grounded toasted glutinous rice (optional) and a pinch of salt and pepper. Place in a bowl with the remaining salad ingredients and pour over the dressing and toss gently. Top with seaweed salad (optional) or you can sprinkle with peanuts and garnish with extra cilantro and mint leaves. 1.) Try grinding the cilantro stems first in a mortar and pestle before adding the remaining dressing ingredients. The gentle crushing encourages the oils and flavor to spill out and combine with the mixture. I love cucumber being a part of the base in Thai salad. This is my all time favorite recipe!! Steak salad is one of my favorites and your salad prompted me to give this a try tonight!! I like the addition of the rice powder – a little crunch is perfect!! 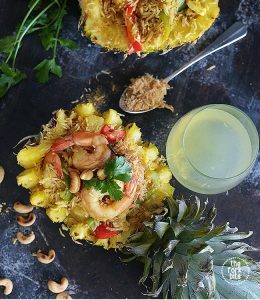 My family loves Thai dishes and this one really makes me so hungry!! I love lime juice dressing because its so refreshing and healthy. And the zucchini noodles are too tasty.. yummy!! I love the fresh lime and garnish it with rice powder. The aroma of the toasted rice powder is so good plus a hint of crunchiness. Been trying to find new ways to spice up my salads and this is definitely one of the lists. Pinning this for my shopping trip later. This salad looks so refreshing!!! The dressing tastes flavorful, I cant wait to try this out soon. This salad looks so delicious! I am always looking for new ways to eat salads as I get bored with them easily (is that just me?). This looks easy to make, I will have to try it. Thanks for sharing! I am a vegetarian, but this still looks so good, I will be saving the recipe for sure to make a veggie alternative. Very healthy and looks delicious. My hubby loves Thai dishes and specially if they are spicy. I’m sure he will love this salad, so I’m saving it, to surprise him!! I often make the vegetarian version of this salad when i am a mood for light dinners…love using fresh cilantro in salads..they add such a good flavor to the food..
YUM! I was looking at what to make with some beef I have in the fridge. This looks like a complete meal. Can’t wait to make it for dinner! THIS IS THE BEST LOOKING SALAD I HAVE EVER LAID MY EYES ON! THIS LOOKS SO DELICIOUS. BALANCED AND HEALTHY! I have never heard of Thai Beef salad before but it looks so yummy. Thanks for sharing this. I hope i get to try it one day. I have to admit that I don’t eat beef but this sounds delicious so I may have to try this with an alternative. Wow!! I do really love salad and this Thai Beef Salad looks so delicious and really tasty. 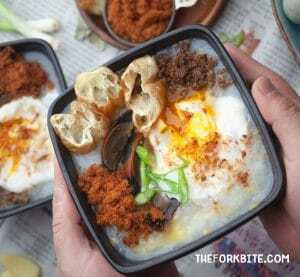 I really want to try this later for our lunch. I bet my hubby will really love this salad recipe. Crazy to admit this but I have never tried Thai Beef Salad ! It looks absolutely divine and I know both myself and my husband would gobble that up! I’m going to give this a try for sure. 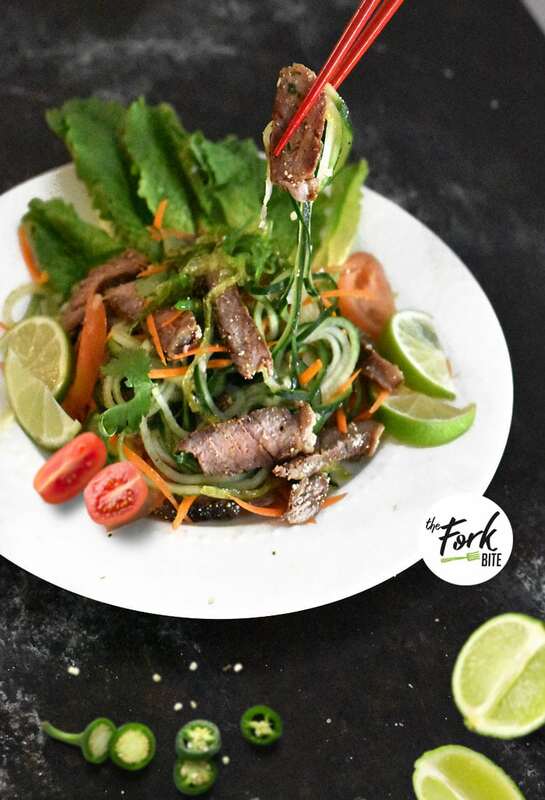 I love a good thai beef salad but you are right, the meat has to be cooked to everyone’s liking, which is very hard. Though I have to admit, whoever wants it well done doesn’t know the real taste of beef, haha. This looks like a great dinner recipe! I love how all the ingredients are so fresh! MMm this looks delicious. I am intrigued with the seaweed garnish, but I am willing to try this! Plus with steak mixed in I may be able to convince my bf to try it. Wow this looks absolutely wonderful and delicious! I will have to try this for my family to enjoy! That sounds amazing! 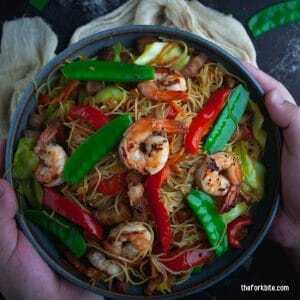 I just made a thai beef vermicelli dish and now I want to make this! 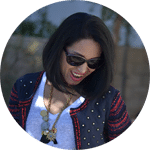 I’ve been looking for new recipes to try, especially healthier ones. I would love to give this one a try! Thank you so much sharing it. Mouth watering! I’m def going try this! This post made me soooo hungry! I love the balance of healthy and deliciousness of this recipe. Can’t wait to try it out. This sounds absolutely gorgeous, I love thai flavors and it always goes perfectly with beef. 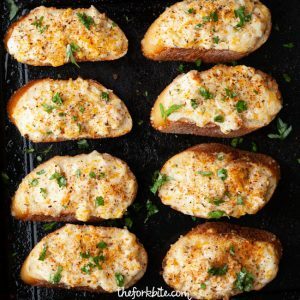 This is going in my recipe bookmarks to try! NOt only is this healthy but it has got to be the best looking salad I’ve seen in such a long time, The dressing recipe is for sure going to be something I;m going to need to try an make. That dressing sounds SO good! I love all the flavors in this. Can’t wait to try it! I’m so here for this! That salad looks delicious and I absolutely love the Thai flavors. I agree quality beef is a must!! 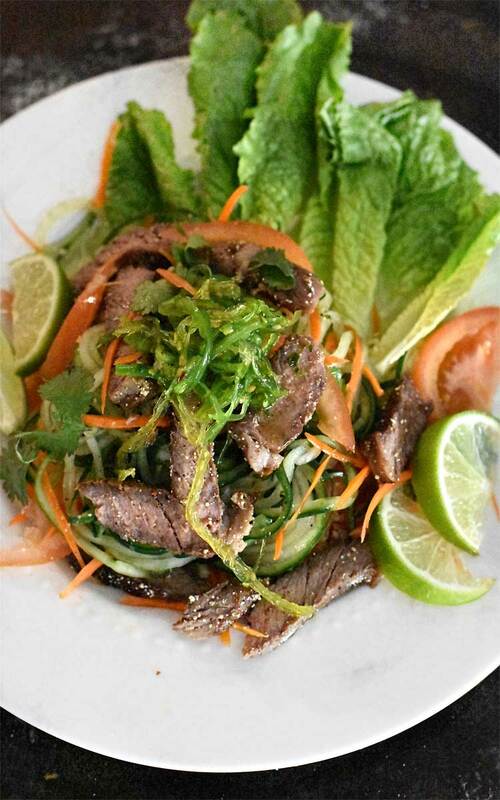 This Thai beef salad looks delicious! I love ordering Thai beef when I go out, now I can make it at home! This looks amazing!! I love that the instructions are really detailed as well. I’m not a great cook, but I’m going to try making this. Going to have to pin this one! yum1! This is what I order every time I go out for Thai food, and the flavors are insane. I love your tip about the cilantro stems! Thai Beef Salad?! Yes pleasssse! This looks like my favorite salad. I would be so happy to eat this ANY season of the year. Thanks for sharing!